Whiplash injuries are a very common accident injury often causing major soft tissue damage. 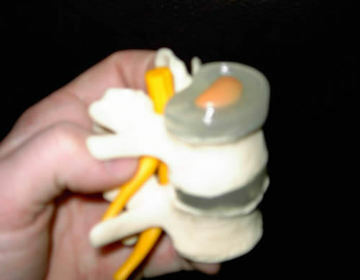 The cervical region takes much of the force of the accident. Head rests, designed to prevent such injuries, can help defeat severe neck damage if they are set to the appropriate height. The average head weighs approximately 15 pounds, thus, even light impacts result in horrific problems to the spinal discs. The whiplash movement is known as hyper flexion and extension. Wikipedia defines whiplash as: "the common name for a hyper extension/flexion injury to the cervical, thoracic or lumbar spines. The injury is referred to as whiplash due to the neck or back being thrown forwards and backwards." The resulting injury not only stretches muscles, ligaments, and tendons, but also can compress the disc between the vertebras. This compression equates to bulging or herniated discs. As the discs impinge on spinal nerves, shooting pains and numbness can occur. Conservative care through chiropractic or physical therapy can lead to some improvement of the symptoms; however, sometimes the damage is permanent. Pain management is then attempted utilizing nerve block injections. If these do not work, then surgery may be an option to remove the damaged disc. Often even surgery does not provide perfect relief, and the discs above and below may be compromised due to the additional stresses of fusion. To complicate matters, when clients have natural degeneration of the spine, or arthritic changes to the spine, coupled with a traumatic injury, causation can be an issue for the personal injury case. Call Benson and Bingham to discuss your whiplash injury or cervical fusion case today.